There’s no need to wait for dark skies to observe and photograph the Moon. Actually most backyard astronomer don’t like the Moon as it just adds to the light pollution and prefer observing when it’s not around. But as the Sun is setting and you’re getting your gear out, it’s hard not to take a few moments to swing the telescope over and observe the Moon. 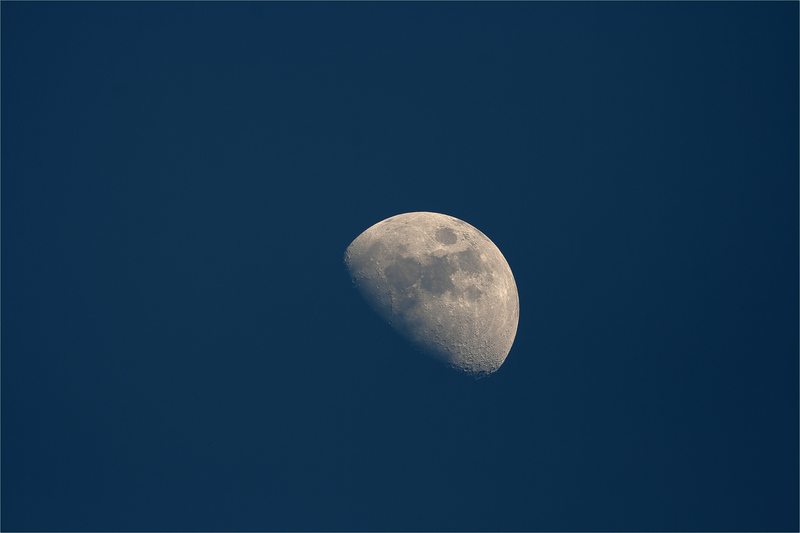 I find the Moon so bright during the night that it almost blinds at the telescope, hence observing it under still blue skies is a great way to observe details without having to squint under darkness. The photo below as taken at 7pm, still not under dark sky conditions. The wavelet processing in Registax greatly increased the finer details on the Moon, however it also increased the noise in the blue sky background. Therefore I opened both the pre and post wavelet pictures in GIMP and created a mask such that on the wavelet layer, only the lunar surface passed. This was done by creating a mask based on alpha (luminance) and using BLUR to flag the entire Moon as my area of interest that I wanted to pass through. This entry was posted in Image Processing, Photo and tagged Astronomy, Astrophotography, Moon by Benoit Guertin. Bookmark the permalink.